Everyone’s trying to enjoy the last few days of nice weather with trail rides, horse shows, and clinics galore. On our way out of the tack room recently, one of us grabbed a spare lead rope for the trailer and was horrified to discover the snap had rusted shut. Gross. Fortunately, there are a few natural remedies for rust on your tack. Of course, if you’re really clever, you can avoid the problem altogether by buying from our shop, where all our products come with no-rust guaranteed stainless steel hardware. –Soak it in white vinegar and water for several hours or overnight before scrubbing. Using crumpled aluminum foil for the scrub will make this job easier. –Use a potato–yes, a potato–cut it in half and slather the open end in dish soap. Let the dish soap end of the potato sit on the rusted area for a while, then rub it off. Repeat as necessary. The surface of the potato and the soap react with the rust to help break it down. Congratulations to Raffie, the winner of our latest tack giveaway! We love hearing from our fans and customers, and learning all about their horses. 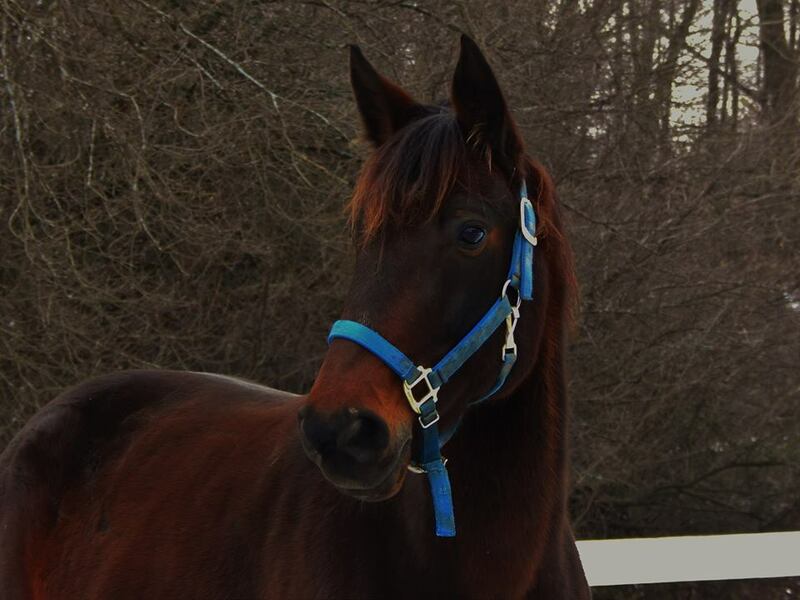 Raffie, aka Raffle Ticket, is a 12-year-old off-the-track Standardbred who lives with Sunshine Horses, a New York-based rescue for former trotters and pacers alike. Raffie won the giveaway thanks to Hannah, who works with Raffie and others at Sunshine to find their second careers and forever homes. 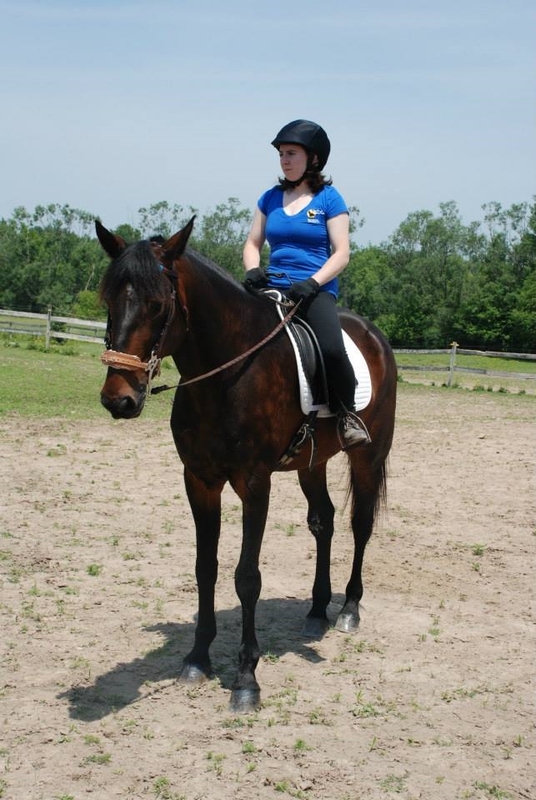 Although she’s a dressage rider herself, Hannah teaches the Standardbreds to go under tack and then dabbles in different disciplines to help them decide what they want to do in the next phase of their lives. Raffle Ticket is still looking for his new person. Could that be you? Learn more about him here. Raffie will be getting one of our split ear Western bridles , which lets a horse’s facial structure shine through. Our bridles are hand stitched for depth and constructed from super strength beta biothane, which is virtually maintenance-free. Our September tack giveaway is for a buckle nose halter. Enter here. Are you and your horse visible on the trail? We don’t know about you, but our area has gotten a lot of rain in the evenings (and on the weekends) in the past month or so, with more on the way. Add more shelves in the tack room–you know you’ll use them. Wipe down insides/outsides of tack trunks. Murphy’s Oil Soap is great for wooden trunks. Update your equine and human first aid kits. Pitch materials that are expired or ruined. Clean and disinfect brushes and towels. Brush therapy is a great cleaner, and white vinegar is a good natural disinfecting agent. Use a damp cloth to clean light bulbs–don’t ever spray with water.